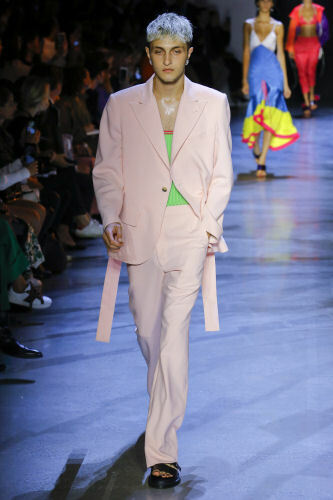 Prabal Gurung’s runway was quite the family affair as all three Hadids – Gigi, Bella, and Anwar – owned the runway showcasing the designer’s vivid color-blocked Spring RTW collection. Inspired by his own unique Nepali background and blending it with modern street style, Gurung designed the collection in hopes to erase boarders and open minds. The collection featured athletic inspired looks for both men and women and was displayed by models from nearly three dozen different countries. 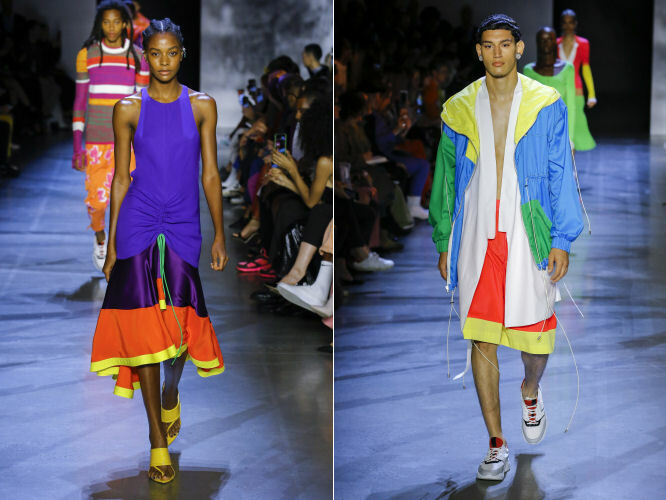 Drawstring pulls drew dresses into hourglass shapes, while oversized windbreakers added volume to the runway. Overall, Gurung said he felt a sense of “relaxed freedom” while designing the collection, keeping it free from over-complications and minute details. Anthony Turner for Hot Tools embraced unique textures, highlighted the mix of matte and shiny finishes, and pulled hair back into messy yet chic looks. The makeup was kept to a minimum and was all about showcasing the models natural and healthy glow. • Use Wella Professionals EIMI Extra Volume Mousse at the roots of hair and the use fingers to pull the product through the remainder of the hair. Rough blow-dry with Hot Tools Black Gold Iconic Dryer, twisting hair to create waves. • Next, spray Wella Professionals EIMI Ocean Spritz throughout the hair until damp to create matte texture. Blow dry again using Hot Tools Black Gold Iconic Dryer. • Once the hair is dry, use a Hot Tools Curling Iron to curl a few sections of hair and backcomb the remaining sections of hair to build volume and rough texture. • Once dry, spray Wella Professionals EIMI Sugar Lift to add shine and build texture. • Gather and pull hair into a pony at the low back of head and secure with an elastic. • Begin to pull out small sections of hair at the hairline to create volume and rough texture on top of the head. • Next, spilt the pony in half. Take the top half, twist hair into a figure 8, and pin the hair at the top and side. Use Hot Tools XL Flat Iron to tame any unruly pieces. • Twist the remaining half of the pony into a chignon, leaving 1-2 inches of the ends sticking out. Pull out pieces of hair for a messy, undone look. • Use Wella Professionals EIMI Stay Essential hairspray and set the top of the head and hair twist. • Finish the look by spraying both Wella Professionals EIMI Sugar Lift and Ocean Spritz to dial up the combination of shiny and matte texture.